As we head into a heatwave it’s important that we do everything we can to ensure the safety of our dogs. There are a number of ways to make their lives more comfortable, most of which are simple and easy to do. Where you can, exercise your dog first thing in the morning or late evening. Taking them for a walk in the strong midday sun on a hot day can lead to dehydration or heatstroke and could put them at risk of burning their paws on hot pavements. Put your hand or bare foot on the ground for 10 seconds. If it’s too hot for you, it’s too hot for your pup’s paws. There are a variety of dog booties which are available to buy to protect your pup from extreme temperatures. Stick to the shade and grassy areas as much as possible. You could also try other forms of stimulation such as practising some training techniques or playing brain games. Ensure your dog always has access to fresh water particularly when you are out on a walk. Encourage them to drink by putting iced treats in their water bowl. If they spend a lot of time outside, make sure they have a water bowl out of direct sunlight in the garden too. Dogs cool from the bottom up so focus on their paws and stomach, not just the top of the dog. When you are on a walk if you come across a shallow puddle or pool of water which is cool, encourage them to stand in it. Even having their paws in cool water for a short while will help their body to cool down. For cool towels, drench them in cool (not really cold) water. This will really help in lowering body temperature and is a crucial step in cooling down a dog who may be suffering from heatstroke. Don’t leave them over your dog for long periods though as once the towels warm up, they will no longer cool your dog down and can make them hotter. Treat them to a paddling pool in a shady spot in your garden filled with cool but not freezing cold water. Freezing cold water can cause your dog’s body to go into shock on a very hot day. 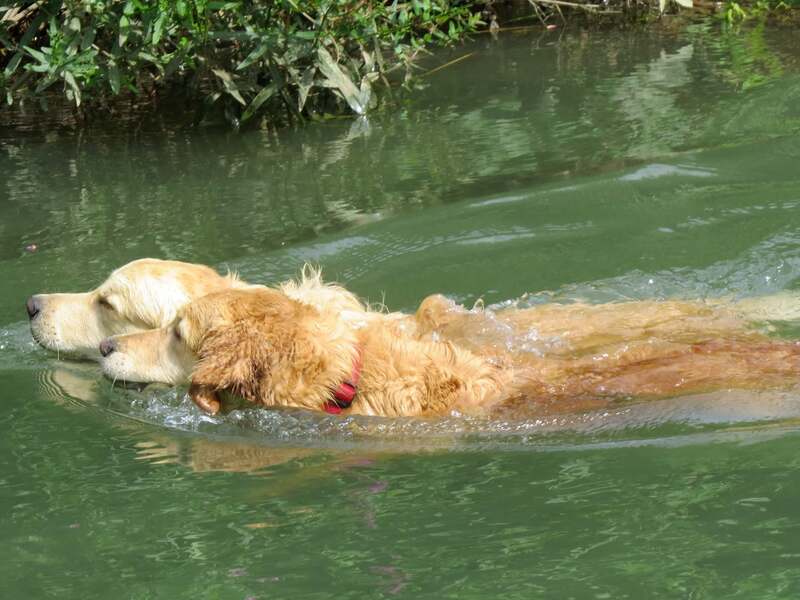 If your dog is not a huge fan of water provide some encouragement as even getting them to stand in the water for a short time is a really effective way of cooling them down rapidly. Keeping their coat wet during any hot spells also provides effective cooling. Dogs gravitate towards cool surfaces when they feel hot. If you don’t have any cool stone floors in your home, there are a wide range of specially designed cooling mats for dogs available to buy. A money saving option is to use freezer blocks or frozen plastic bottles of water, well wrapped in a blanket in your dog’s bed which will have a similar effect. There are a variety of cooling coats you can buy for your dog, which can provide longer-lasting coolness. These are activated with water and as the moisture in the coat evaporates, it draws out the heat from the dog’s body and cools them down. Or you could try a cooling collar. Some contain a special self-cooling gel and others need to be filled with ice or placed in the freezer. As a money saving option, soak a kitchen cloth pop it in the freezer, or wrap ice cubes inside it. Both will do a similar job. Make ice cubes or lollies with your dog’s favourite treat inside, or stuff a Kong and pop it into the freezer. Frozen carrots or apple slices are a healthy but tasty snack. Add ice cubes to their water bowl. Place a fan next to your dog’s usual resting spot. For an extra cool breeze put some frozen water bottles in front of it. If your dog is always walking around with toys in their mouths, pop their favourite in the freezer. Filling a spray bottle with cool water and misting your dog regularly will help keep body temperatures down, as will a garden sprinkler – if you can get your dog to walk through it! If you see a dog locked in a parked car particularly in extreme heat call the police immediately. On longer trips, make sure you have water for your dog, keep the air conditioning going or have the windows open if you can and if it is safe for your dog. Do not allow them to travel with their heads out of the window – this is very dangerous. Dehydration in dogs can be caused by a lot of things one of which is heatstroke. Loss of skin elasticity. If you lift its skin, it will take longer than usual for the skin to fall back into place. Dogs cannot sweat. They cool down by panting, so an overheated dog will drool excessively. It can result in collapse, excessive panting, purple gums and redness of the skin. If you see any signs at all, find a shaded area, provide water, wet the coat or cool your dog with a wet towel and contact your vet immediately. Pale-coloured dogs are vulnerable to sunburn, particularly on their ears, noses and area where their coat is thin. As with humans, sun damage can lead to skin cancer. Sunlight can also make existing skin conditions worse, particularly if your dog has allergies. You could pop a T-shirt on your dog to cover vulnerable areas for protection (a cool coat would provide two forms of protection) or, you could apply a non-toxic waterproof human sunblock or one specifically made for pets. If your dog’s skin looks sore, crusty or scaly, consult your vet.